Dr. Odhner grew up with her three siblings in a suburb of Northern Virginia. A former pole vaulter, she was recruited to jump for Virginia Tech in Blacksburg, VA, where she earned her Bachelor of Science degree. After college, Dr. Odhner worked at an orthodontic office for two years in Washington, D.C. Her experience there inspired her to pursue a career as an orthodontist. 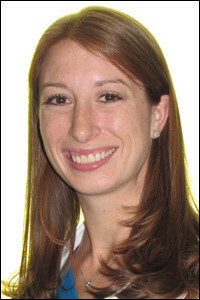 Dr. Odhner then went on to earn her Doctor of Dental Medicine degree at the University of Florida. After dental school, Dr. Odhner completed an additional two-year residency training at Temple University, where she received her Master of Science degree, as well as a specialty Certificate in Orthodontics. When Dr. Odhner is not straightening smiles, she enjoys spending time with her husband Matt, who is a native of Huntingdon Valley, PA, and their 8 year old white lab named Donovan (after former Eagles quarterback, Donovan McNabb). While Dr. Odhner grew up rooting for the Washington Redskins, she finds herself cheering for the Eagles as well so that her husband is happy. Luckily, both Dr. Odhner and her husband share the same Hokie pride and love watching Virginia Tech football games together. In efforts to stay active, they have both recently gotten into cycling and enjoy going on long rides through Bucks County whenever they have a chance.